Welcome to Carol’s School of Motoring. If you are looking for a driving school that provides high quality driving lessons with commitment to service that’s second to none and all at affordable price, then look no further. Well established local instructor with a higher than average pass rate approved by the Driving Standards Agency, who make regular checks to ensure a high standard of tuition is being maintained. Qualified member of the Institute of Advanced Motorist and has acted as a driving observer on their behalf. Patient and Friendly Instructors who will make you feel welcome and comfortable especially nervous pupils. Gloucester Driving Lessons from Female Driving Instructor. Pass your Driving Test with us. 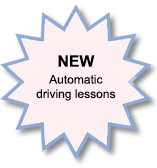 Carol Pepperell Driving School Gloucestershire.